Edison State shortstop Lexie Long turns a double play against Wilmington College Tuesday. 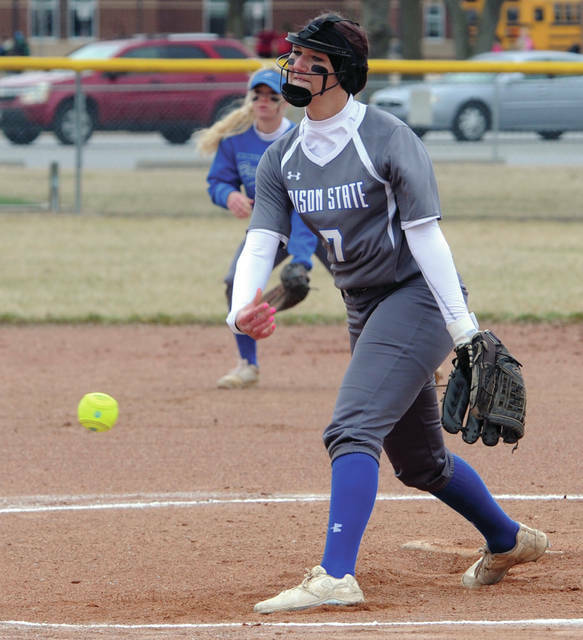 Edison State pitcher Lexi Romine fires a strike Wednesday. Edison State third baseman Wendy Hawk makes a throw to first base for an out against Wilmington College Wednesday. 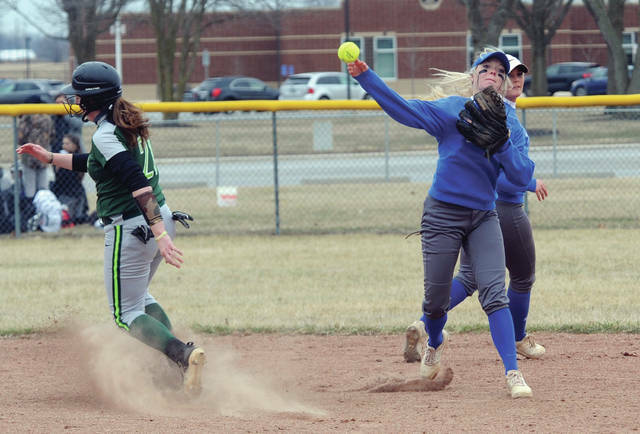 COVINGTON —- Edison State Community College softball coach Dan Cain was a lot happier with the finish than start Wednesday as the Chargers played their home opener at Covington High School for the second straight year. And after an 8-4 loss to the Wilmington College JVs in the opener, Edison bounced back with a 10-2 win by run rule in six innings in the nightcap. It was particularly costly in the second inning, when Edison turned what should have been a one or two run inning into a 5-0 lead for Wilmington. Shelby Raby led off the inning for Wilmington with a single and the ball rolled all the way to the fence with Raby finishing on third. That was followed by a fielder’s choice and a squeeze bunt, where Edison did not record an out. On a single to right field, Edison had a force at second, but never made a throw there. Makenna Montgomery brought the second run of the inning in on a fielder’s choice. Je’Taysia Jones then made Edison pay with a three-run homer to cap the rally. After trailing 7-0, the Chargers scored four unanswered runs, but that was as close as they could get. 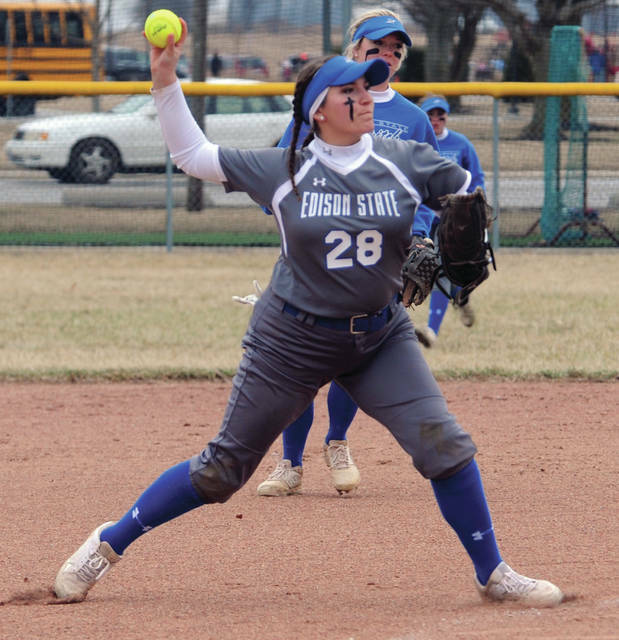 Wendy Hawk’s drive to deep center field scored two runs in the fourth, while in the sixth, Lexie Long and Rayna Brownlee executed a double steal to score one run and Hallie Snyder had a RBI single. One highlight for Edison in the opener was the double play combination of second baseman Brownlee, shortstop Long and first baseman Tackett. They turned two double plays to get out of jams. The first went from Brownlee to Long to Tackett. On the second, Brownlee tagged a runner going to second and threw to Tackett to complete the double play. The Chargers did exactly that. Tori Smith and Maddy Collier combined on a five-hitter and Edison scored four runs each in the second and third to put the game away. Lexi Romine and Snyder had pitched in the opening game. Back-to-back doubles by Maddie White and Snyder sparked a four-run second inning and Adrianna Hicks had a single and scored on a double steal. Hicks came up big in a four-run third inning. With Edison leading 5-0 after Romine had singled and Snyder had singled and Brownlee drew a bases-loaded walk, Hicks came to the plate with two outs and the bases loaded. She drilled a bases-clearing double to make it 8-0. Wilmington got two runs in the fifth to extend the game, before Edison scored two runs without a hit in the sixth to end it. Long and Romine had fielder’s choices to end it. Romine had a double earlier in the game. As they showed with their response in the second game Wednesday.